"My family lives in Louisiana, and this recipe (something different) was handed down from my Mom years ago." Cook asparagus in a large pot of lightly salted boiling water until tender, 5 to 8 minutes. Drain well and set aside. Scoop yolks out of hard-cooked eggs and transfer to a bowl; mash yolks with a fork. Mash deviled ham spread, cream, onion, 3/4 teaspoon dry mustard powder, Worcestershire sauce, and 1/2 teaspoon salt into the yolks until thoroughly combined. Fill cavities in egg halves with the yolk mixture; set deviled eggs aside. Melt 6 tablespoons of butter in a saucepan over medium heat, and whisk flour into butter until smooth and bubbling. Whisk in milk, a little at a time, until the sauce is smooth and thickened; reduce heat to low and simmer for 5 minutes. Whisk in Cheddar cheese, 1/4 teaspoon dry mustard powder, salt to taste, and black pepper; stir sauce until cheese is melted and incorporated. Spread asparagus into the bottom of a 9x13-inch baking dish. 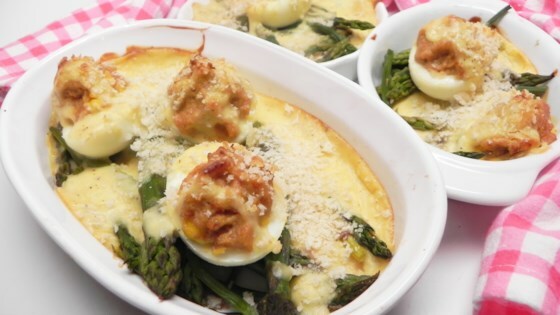 Arrange the deviled eggs on top of asparagus; pour the cheese sauce evenly over the deviled eggs. Mix crushed corn flakes with 2 tablespoons melted butter in a bowl; sprinkle over the casserole. Bake in the preheated oven until the sauce bubbles and the topping is browned, about 20 minutes. I liked it very much. I don't know what 'ham spread' is and I can't buy it anyway. I opened a tin of duck pate with foie gras in it. Scrumptious! Ditto Maria's comment. Great recipe, the kids even ate it!